A warm and comforting home-style paleo whole30 breakfast casserole. Made with sweet potato, turkey sausage, and eggs. And easy healthy dairy free breakfast recipe. This recipe can be made ahead and frozen. Mix all ingredients for sausage together in a skillet and cook over medium heat for 8-10 minutes until cooked through (undercook slightly so it can finish cooking in lasagna). Layer shredded white sweet potato, sautéed onion, spinach, and sausage into an 8" by 5" casserole dish. Bake on 350F for about 50 minutes until baked through- when cooked, the middle of the casserole should spring back when you press your finger into the middle. Nutrition Facts Whole30 Breakfast Lasanga Amount Per Serving Calories 477 Calories from Fat 198 % Daily Value* Total Fat 22g 34% Saturated Fat 6g 30% Polyunsaturated Fat 5g Monounsaturated Fat 8g Cholesterol 299mg 100% Sodium 786mg 33% Potassium 919mg 26% Total Carbohydrates 31g 10% Dietary Fiber 6g 24% Sugars 15g Protein 40g 80% Vitamin A 368% Vitamin C 52% Calcium 10% Iron 41% * Percent Daily Values are based on a 2000 calorie diet. Easy homemade breakfast sausage recipe. Paleo, whole30 friendly sausage, and ready in 10 minutes! Perfect served alongside eggs of a pile of greens. Full of flavor, fresh herbs, and lean turkey meat. Heat a skillet over medium heat. In a bowl add all the ingredients for the sausage and combine (I use my hands). Use a medium/small ice-cream scoop and fill the skillet with sausage balls then press down with a fork. Cook on each side until golden (about 1-3 minutes each side). 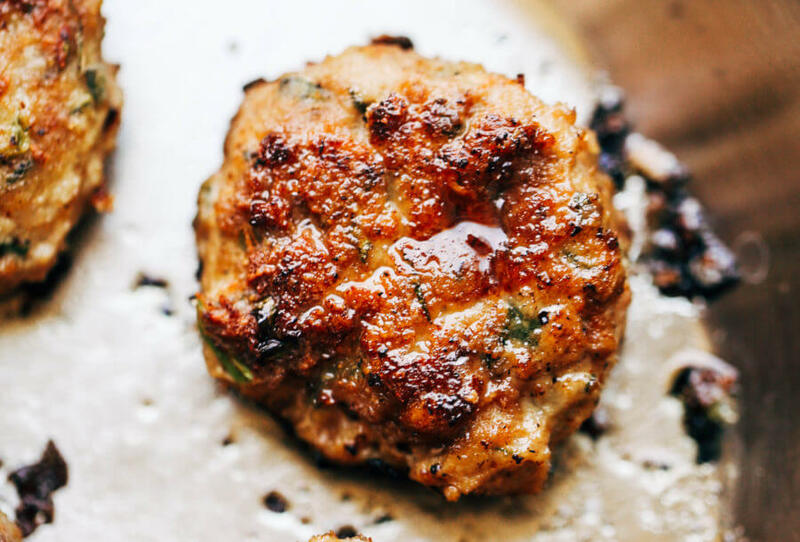 Nutrition Facts Sage Rosemary Turkey Sausage Patties Amount Per Serving Calories 130 Calories from Fat 72 % Daily Value* Total Fat 8g 12% Saturated Fat 2g 10% Polyunsaturated Fat 1g Monounsaturated Fat 2g Cholesterol 53mg 18% Sodium 330mg 14% Potassium 121mg 3% Total Carbohydrates 3g 1% Dietary Fiber 1g 4% Sugars 1g Protein 12g 24% Vitamin A 4% Vitamin C 8% Calcium 2% Iron 10% * Percent Daily Values are based on a 2000 calorie diet. 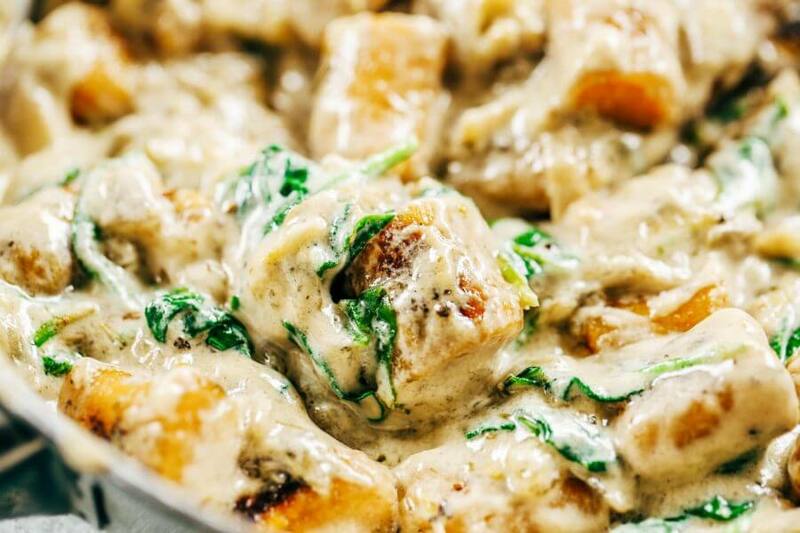 Unbelievably easy oven baked Paleo turkey meatballs and sage cream sauce. (Gluten free, whole30, paleo). Perfect for a weeknight dinner or breakfast! On the table in LESS than 25 minutes! 2 cups full fat coconut milk be sure to use full fat canned coconut milk (otherwise, the sauce won't be thick and creamy). I used Chaokoh brand. Preheat oven to 375F. Line a baking tray with parchment paper and drizzle it with avocado oil (about 1-2 tablespoons). In a bowl combine all ingredients for the meatballs (except the oil). Form 1 1/2" round meatballs by scooping some mixture into your hand and rolling until round. Place the meatballs on the baking tray with parchment paper and roll lightly in avocado oil (that is already on the tray). Bake on 375F for 20 minutes until golden. In a pan saute onions and garlic for the sauce in 2 tablespoons oil (avocado or olive). Once the onions and garlic are golden brown add in the rest of the ingredients for the sauce and heat until simmering. Then take off the heat and pour over meatballs. To make this a complete meal I love sautéing 4 cups cauliflower rice with 4 cups kale and serving the meatballs alongside (or over) the veggies. 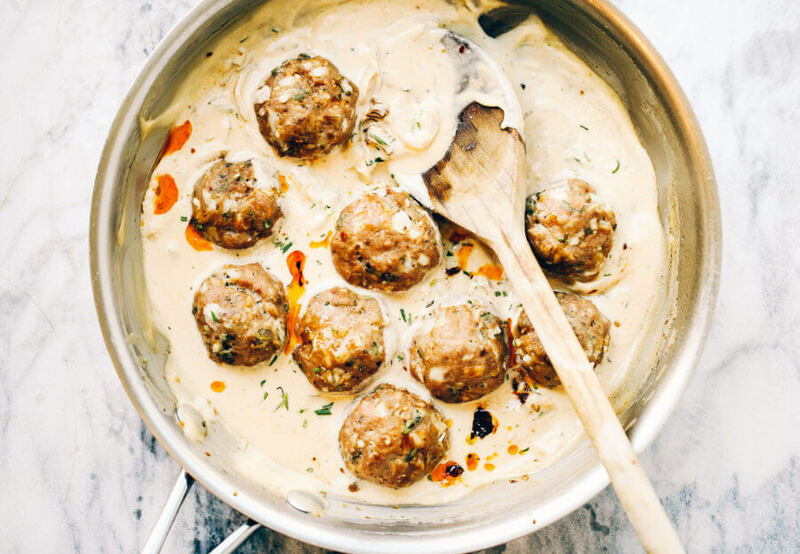 Nutrition Facts Turkey Sausage Meatballs In Sage Cream Sauce Amount Per Serving Calories 98 Calories from Fat 63 % Daily Value* Total Fat 7g 11% Saturated Fat 4g 20% Polyunsaturated Fat 1g Monounsaturated Fat 1g Cholesterol 19mg 6% Sodium 126mg 5% Potassium 71mg 2% Total Carbohydrates 2g 1% Dietary Fiber 1g 4% Sugars 1g Protein 6g 12% Vitamin A 1% Vitamin C 3% Calcium 1% Iron 5% * Percent Daily Values are based on a 2000 calorie diet.